DAS publishes 3 Newsletters annually, generally in January, May and September/ October. These are currently mailed in hard copy-only to members. 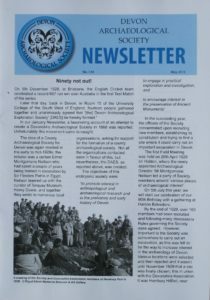 Contents include news about Archaeological activities within the county, members and events being held by DAS and associated organisations. Copies of Newsletters may be ordered from the Publications Officer, using the Publications Order Form. The latest newsletter will be sent to those joining DAS.